If you wish to upgrade from your old scooter to a new one, you may want to consider buying the Razor A Kick Scooter. It is important to understand that Razor is one of the bestselling brands in the world when it comes to scooters. The company is not only known to offer great adult scooters but also stands out when it comes to kids scooters. So you should expect nothing but outstanding performance from the Razor A Kick Scooter. This is the best scooter for the riders who love to burst out new tricks, cruise around town in style or shred the pavement. This scooter has a sturdy construction with added features you will not find in most scooters in the market. There are many reasons why Razor A Kick Scooter has so many positive reviews online. So here is a look at why this is the scooter you need to try. Foam Grips: On major drawback most scooters in the market have are poor quality grips. They make you feel uncomfortable. However, the Razor A Scooter is designed with foam grips that keep the hands comfortable when riding. So you can ride this scooter for longer. Wheel Type: When you take it out of the box, the first thing you will notice is that the wheels are quite bigger than the ordinary scooter. This size of wheels is especially important if you want to have a smoother ride. The wheels used on the Razor A Kick Scooter also have an impact on the riding experience. These are urethane inline style wheels that measure 98mm and provide a lot of traction. Urethane has been used to ensure that the wheels move fast and glide for longer. The wheels have been fitted around the ABEC 5 bearings that also help them spin faster and smoother. You always have a peace of mind if you know your kid is using a safe toy. The urethane wheels help with the stability of the scooter and minimize the chances of your kid falling. This is what makes it the best for people who are learning how to ride and those who are experienced enough to do tricks. You will enjoy better the performance of the wheels if you ride your scooter on a smooth pavement or skate parks. Scooter Type: If you are looking for a folding two wheel kick scooter then Razor A Kick Scooter is what you need to get. 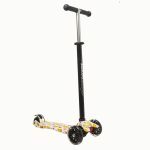 The scooter features sturdy aluminum construction which enables it to withstand any type of impact during use. The folding design makes it easy to transport or store. 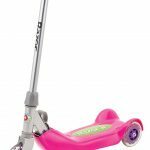 If you want a scooter for your five-year-old kid then you will love the fact that the Razor A Kick Scooter is low enough to keep your child safe. The handlebars are the other selling point of this scooter. They are adjustable and can be set to a child’s height. The spring-less shock system and a wheelie bar add fun to the riding experience. As a safety feature for the rider, this scooter uses a rear wheel fender friction brake that will stop the scooter when a rider applies pressure to the rear fender. 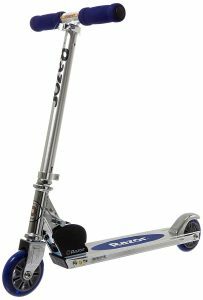 Pros: If you are simply looking for a scooter to do some more tricks and hops then Razor A is a pretty good move. This is possible as the scooter comes with an anti-shock system in the wheels and fork. This means it can handle speed better and also offer a smoother ride. The other benefit of this scooter is that it is not only meant for kids but for adults too. Since it can handle a weight of up to 143lbs, it can accommodate teenagers or young adults as long as they are not more than 143 pounds. The fact that the handlebars are also extendible means it can be used by kids of different ages. So you only need to buy one scooter for the entire family. Portability is key when buying a scooter or any other toy for that matter. When a scooter is portable, you won’t have to buy another one when you travel out of town. Razor A is one such scooter. It is foldable and can fit in a small space making it easy to carry around. The other thing that makes this scooter sell out is the fact that it comes in 7 different colors; blue, clear, green, pink, red, sweet pea and clear/black. This means you can have a scooter that matches your personality. So if you wish to get your daughter one for Christmas, a pink or sweet pea will just be perfect. Boys can ride in any other color. There is a wide range of options for everybody. This scooter doesn’t require any assembly. So it is ready to use as soon as you take it out of the box. Cons: The only shortcoming that has been experienced with this scooter is that it doesn’t brake well especially when the surface is wet. Also, this scooter may not be the cheapest in the market. So it may not be the best option if you are working on a tight budget. The scooter is light in weight which makes it quite easy to maneuver. It is 26.5 inches long and 13 inches wide. The height is 34 inches and only weighs 6 pounds. There are many scooters out there but you should always get the best and most original for better performance. The Razor A Kick Scooter is what you should consider. It has the strong design elements that have been used throughout their scooter range. There are a few cons but they don’t affect the performance of this scooter. Razor A Kick Scooter is easy to use as compared to others in the market and provide a rider features that can help him/her execute tricks and glide effortlessly. Also, the Scooter has been really well made to provide a strong platform to skate on. So make sure you get yours.